Following a heated series of tense APEC meetings, Prime Minister Scott Morrison has used Australia’s central role in supporting the hosting of the meetings to reaffirm old alliances and double down on the nation’s commitment to an open and transparent regional order. The growing geo-political tensions and competition were on show at the latest Asia-Pacific Economic Cooperation (APEC) Summit held over the weekend in Port Moresby. For Prime Minister Scott Morrison, the summit provided the perfect opportunity to expand on the government's renewed commitments to the Asia-Pacific and south Pacific regions. "I have already made it clear as Prime Minister that Australia is stepping up. We will step up as part of our ‘step-up’ initiative in Pacific. 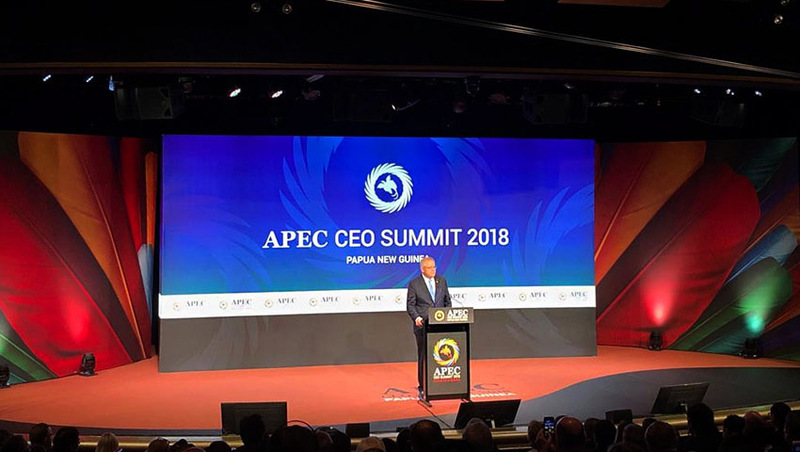 We are taking and will take our engagement in the Pacific to a new level," Prime Minister Morrison said in his address to the the APEC CEO Summit. Regional strategic partnerships and alliances to promote transparent dialogue and amicable strategic relations. For Australia, both economically and strategically, alliances, friendships and military partnerships have been the bedrock upon which the nation has built its prosperity and stability, and the PM used APEC to reaffirm the central role of these, particularly with the US and Japan. "On 12 November, Australia, the United States and Japan signed an MoU to support trilateral co-operation in the Indo-Pacific region," Prime Minister Morrison said in a joint press statement with Japanese Prime Minister Shinzo Abe. This memorandum of understanding between the three nations formalises the trilateral partnership for infrastructure investment in the Indo-Pacific, which was announced in July. As part of the MoU, the three countries will collaborate to finance infrastructure projects and mobilise private sector investment to drive future economic growth, job-creation and poverty reduction. This comes on the back of the PM's announcement of the $2 billion Australian Infrastructure Financing Facility for the Pacific, which will boost Australian support for concessional infrastructure development throughout the region, supporting partners like Papua New Guinea, Fiji and the Solomon Islands and others within the broader APEC community. Prime Minister Morrison also used APEC to further strengthen Australia's strategic and security-leader role in the Indo-Pacific and south Pacific regions. The core of this commitment includes Australia's continuing commitment to enhance and expand the nation's military commitment to the region as part of the nation's 'Pacific Pivot'. The local construction of the new Pacific Patrol Boats, which will be gifted to regional partners to support increased maritime security. Australia will also provide training and infrastructure upgrades to support the domestic security and defence capabilities of regional partners like Vanuatu, with the Prime Minister outlining an expansion of the island nation's police force and the appointment of a new Australian defence adviser in Vanuatu. The growing strategic, economic and political competition between China, the US, Japan and Australia also served as a central point of concern for the Prime Minister and the nation's continuing commitment to regional peace, prosperity and stability. "I said when I outlined our 'step-up' initiative, that we were happy to work with all partners through the region, whether it’s the United States or China or indeed of course Japan ... I’ve set out some very clear markers and criteria of where countries can work together. Now, that’s what we’re doing with the United States and Japan and as cases present themselves we’d be very pleased to do that with China as well," Prime Minister Morrison explained. The Prime Minister also highlighted the role India will play in enhancing Australia's relationships and interconnectedness in the region, with him to welcome the Indian President to Australia in the inaugural state visit by an Indian President from 21 to 23 November. "Our two nations have deep economic, government and people-to-people ties. We are strong democracies and share a longstanding commitment to the rule of law. India is a critical partner in the Indo-Pacific region and a strong economic contributor to Australia. In 2017, our trade relationship was worth more than $27 billion," Morrison's statement said. "Australia and India are close strategic partners and I look forward to building on our relationship as it continues to grow in strength.". Despite the mounting economic and strategic tensions, particularly between the US and China, the Prime Minister remained firm in highlighting the importance of both China and the US in the region and recognised their ongoing importance to Australia's own prosperity and security. "Our comprehensive strategic partner in China, of course, but also our dear and long-held friend and ally, the United States. So we’ll continue to pursue our specific interests here and work together with our other partners – whether it was at the East Asia Summit or here at APEC and particularly last night. "I was able to host our Pacific family and friends at the residence and we were able to talk about these issues together as well and our step-up initiative has been very warmly received by them and we announced last night, a number of other initiatives in Vanuatu and the Office of the Pacific and they were well-received," Prime Minister Morrison said today. Australia's growing economic and strategic pivot to the Pacific provides new opportunities for Australian businesses of all shapes and sizes as the nation continues to invest in both regional infrastructure and defence capability to ensure the enduring peace, prosperity and stability of "our patch".